Sat., Aug. 25, 2018, 10:16 a.m. The reaction in Seoul and Beijing came hours after President Donald Trump directed Pompeo to delay his trip because of what he saw as a lack of progress on nuclear disarmament talks with the North. Trump also said the nuclear negotiations with North Korea have been hampered by a lack of support from China, which is the North’s only major ally and is engaged in an intensifying trade dispute with the United States. The Chinese foreign ministry blasted Trump’s comments. Beijing supports “advancing the process of a political settlement” following the Trump-Kim meeting in Singapore, the statement said. Meanwhile, while describing the postponement of Pompeo’s trip as a setback, South Korea’s Foreign Ministry said it expects China to continue serving a “constructive role” in international efforts to solve the nuclear crisis and noted that Beijing continues to express commitment to fully implement sanctions against the North. “It’s most important to maintain a long-term view while maintaining a momentum for dialogue and concentrate diplomatic efforts to faithfully implement the agreements from the summits between South Korea and North Korea and between North Korea and the United States, instead of attaching meaning to each change in the situation,” the ministry said in a statement. 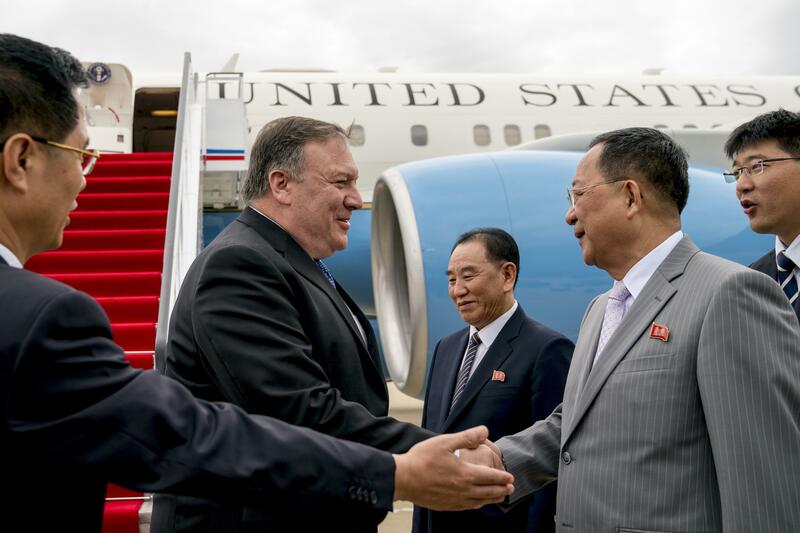 “While we consider the delay of the visit to North Korea as unfortunate, we believe it’s most important for the North Korea-U.S. dialogue including Secretary Pompeo’s visits to North Korea to contribute to substantial progress in complete denuclearization and the establishment of a permanent peace regime in the Korean Peninsula,” the statement said. South Korean Foreign Minister Kang Kyung-hwa spoke with Pompeo over the phone and agreed the allies should work to keep the atmosphere of dialogue alive, it said. Published: Aug. 25, 2018, 10:16 a.m.